CD Projekt Red lifted the lid on a whole new pile of Witcher 2 details today, including a massive collector's edition, digital distribution promos and some very surprising news about your DRM options. The Witcher 2: Assassins of Kings is coming next year and at a conference today, CD Projekt Red dropped some pretty amazing details about what we can expect on the big day. The game will be released in two editions, Premium - which is the "basic" edition - and a ridiculously over-the-top Collector's Edition. The regular version is "premium" because it's going to include a whole pile of extras including a pamphlet lifted directly from the game, papercraft models of Geralt and another random character, a strategy guide, a "cursed coin" and more. CD Projekt said the idea is to hearken back to "the way games used to be," when publishers put more into boxes than just a disc and a little piece of paper. For those who want even more, there's the truly epic Collector's Edition, which will include the game as above along with a bag of five dice, a full-sized deck of cards, Dandelion's guide to cheating at dice and cards (I'm not making this up), a 200-page hardcover art book, more papercraft, unique colletor's edition DLC and the piÃ¨ce de rÃ©sistance, an imitation marble bust of Geralt that looks big and heavy enough to do some serious damage in an emergency. The Witcher 2 is available for preorder from the usual retailers as well as various digital distributors including Steam, but it can also be preordered and purchased from none other than GOG.com, CD Projekt's "sister company" that normally deals with re-releases of older games. It may not be old but it certainly looks good and GOG is offering a number of very cool incentives to buy it from them, most notably that, like everything else in its catalog, The Witcher 2 on GOG will be completely DRM free. Sweetening the deal even more, GOG is offering a "fair price package" on the game, giving buyers in Europe and the U.K. an in-store credit in U.S. dollars to make up the price difference between their purchase and the worldwide, ie. U.S., cost. Gamers who preorder and purchase through GOG will also be given one of five classic RPGs as a bonus along with GOG-exclusive DLC. The digital edition of the game from all online retailers will include all of the content that comes with the standard release of the game - remember, that's the "premium" edition - in digital format. The Witcher was the very definition of a sleeper hit and CD Projekt is clearly serious about building on that success. The Witcher 2: Assassins of Kings is scheduled for release on May 17, 2011, exclusively for the PC. 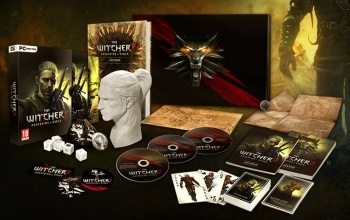 More information about the game, the preorder and more can be found at buy.thewitcher.com.